A few weeks back I was in the middle of a portrait shoot when I spotted one of those chance frames that really stopped me in my tracks. Not for the first time, it involved one of London’s bridges. 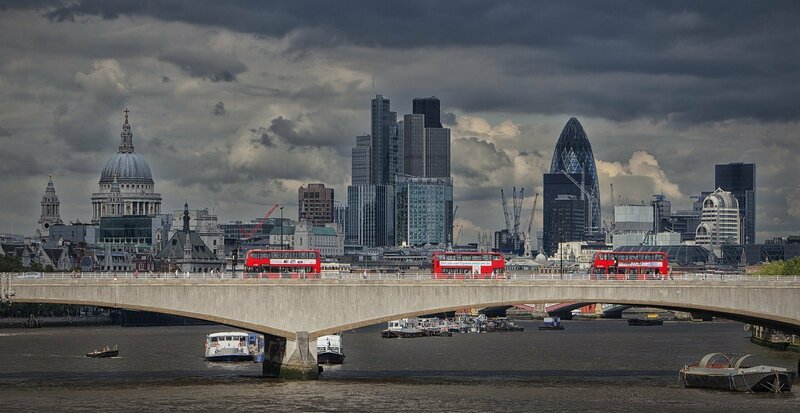 These three red buses, set against a diabolical, stormy City backdrop, became a very popular image of the weird weather of Summer 2012. Pre-Olympics, at least. Nothing much to this. The natural lighting brought the buses into vivid highlight. There is a little processing on the sky using a Nik Color Efex Pro 4 filter called “Detail Extractor”, but used sparingly. 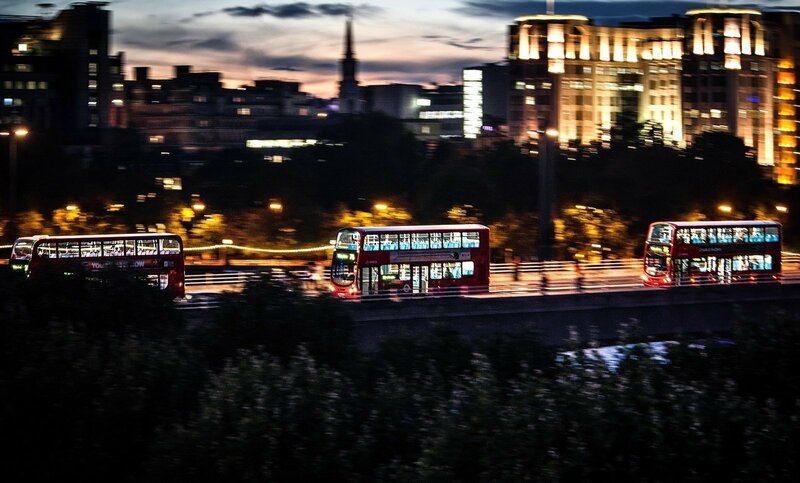 Then earlier this week, up on the roof of the National Theatre for an event shoot, I spotted buses again. On the same bridge, but from a completely different angle. And just as the last dusk light was fading from the sky. The camera in my hand was a bit of a beast: a Canon 5D MkII, fitted with 70-200mm lens and a 1.4 magnification lens extender, all adds up to around 2.5kg of hardware. A lot to wave around. But wave it around I did. The shot I wanted to try, in the few minutes I could justify during a gig, and before the fast-failing light vanished, was a panning shot. Of a bus on the bridge, naturally. Very simply, this is where you set the camera up with a fairly slow shutter speed. And keeping the camera perfectly controlled, you swing it at the same speed and direction as your subject is moving, and take the shot. You “pan” to keep track with the motion of your subject. This gives the illusion that the subject is frozen in time, with the rest of the world blurred slightly in relative motion to it. Fair enough with a small lens at a reasonably wide-angle. There’s a lot of latitude for error. But with this beast, it was going to take a lot of luck. The luck came. The shot that worked best actually had three almost-evenly-spaced buses on the bridge. A nice counterpoint to the daytime shot. You can see the way the panning effect works best of all by looking at the pedestrians on the bridge. Though at the same distance from the camera as the buses, they are motion-blurred, not depth-of-field blurred. This led to all sorts of thoughts in my head about escape from a city, as the day ends – of buses returning home to roost – but make of it what you will. I find the best panning motion is to rotate, not from the hips, but from the knees. If it’s steady and smooth, then it’s fairly straightforward to get a crisp image once the right exposure settings are locked in. Provided that you can eliminate any vertical movement in the lens – much easier said than done. Turn image stabilisation off, if you have it, unless you have a “panning mode” – IS Mode 2 on this particular lens. This will allow the lens to move freely in the horizontal direction in this case, only suppressing small movements in the vertical plane. Let me know if you want a print (I’m doing a very limited run of them). *What the Exif notes mean: this is detailed data about how the photo was taken – first, the focal length of the lens, then ISO (the sensitivity of the sensor: low number for bright conditions, high for dark or indoors), then f number (the size of the hole that lets the light into the camera: low = big, high = small), finally the exposure time (how long the shutter is open) in seconds. They are marvelous – how much for a print of each and what sizes are you going to print? You are quite right. Mode 2 on that lens allows freedom of linear movement – i.e. the lens won’t try to “snap” to a moving object in the direction that the lens is being moved, but will offer stabilisation for movement perpendicular to that direction. Well spotted. I will reflect this in the post.